Your vehicle's cooling system maintains the engine temperature within its optimum range; ensuring the engine operates at its most efficient level. The cooling system also delivers heat to the cabin and defrosts your windows. See more on cooling system operation. If the cooling system fails, serious problems can occur, overheating can damage critical components or ultimately cause engine seizure. Here is more on cooling system problems. The cooling system includes a radiator, cooling fan, water pump, thermostat, and high-temp hoses. Fluids flow throughout the engine block and heads. Each of these components exhibits different symptoms in the event of breakdown or failure. Hyack Excel Tire's auto techs have the experience to recognise the signs of cooling system problems. Ask us to perform a Cooling System Maintenance Check each year or if your notice any cooling system problems. If you notice any of these symptoms (cooling system problems) give us a call, we’ll set you up an appointment and get your car in the shop ASAP. Hyack Excel Tire can troubleshoot any cooling system problems and make the necessary repairs before they cause severe damage. At Hyack Excel Tire, we only recommend the repairs and products that you need. Visual inspection of the cooling system, including belts and, hoses. Test the radiator cap pressure to ensure it for works at the recommended system pressure level. Check Thermostat for proper opening and closing. Pressure-test entire cooling system to identify any external leaks; including the radiator, water pump, internal engine coolant passages, hoses, cabin heater hoses and cabin heater core. Internal leak test to check for combustion gas leaking into the cooling system. Engine cooling fan test to confirm proper operation. Hyack Excel Tire's Cooling System Maintenance Check is designed to identify areas that need attention. One or more of the following may indicate your cooling system needs service. If you notice any of these symptoms, let Hyack Excel Tire inspect your Cooling System. The modern automotive cooling system is responsible for regulating the engine's temperature and preventing possible overheating. The cooling system includes many parts specifically a radiator, water pump, a cooling fan, thermostat, high pressure/temperature hoses, heater core, heater valve, and more. 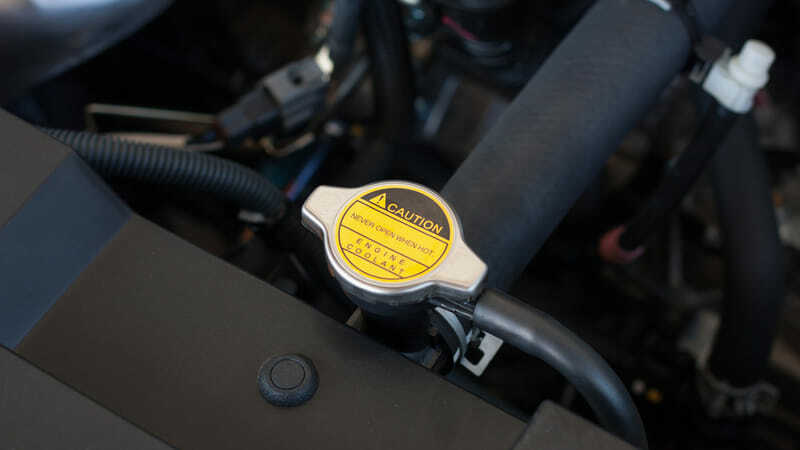 The coolant fluid is usually a mix of water and antifreeze (ethylene glycol); the coolant is required to remain a liquid throughout the car's operating temperatures, to protect the cooling system components from corrosion and freezing. When the engine reaches its designed operating temperature, the thermostat opens and releases coolant (antifreeze) to flow from the engine to the radiator. Once in the radiator, the fluid flows through a maze of tubes covered with heat fins which dissipate the excess heat into the surrounding air. The fan pulls air through the radiator in aid of this process. The fluid in a cooling system will reach temperatures well above the boiling point of water. Therefore a mixture of antifreeze is used to keeping engine coolant from freezing or boiling. The heated antifreeze (coolant fluid) flows through the engine, then cycles back to the radiator, where the excess heat escapes, reducing the temperature of the antifreeze; which then flows back into the engine to dissipate additional heat. Antifreeze breaks down over time, due to repeated heating and cooling, and loses its ability to protect the engine from corrosion, maintain its liquid state, and efficiently remove the excess heat from the engine. Replacing the antifreeze on a regular basis is critical to the operation of the cooling System. During the Cooling System Flush and Fill service, our auto techs will drain the antifreeze from the radiator, flush water through the cooling system to clean it out, and then fill the radiator with new antifreeze. The cooling system’s cooling fan draws air through the radiator; extracting excess heat from the radiator's fins. If the cooling fan malfunctions, your engine will overheat. Hyack Excel Tire's service techs are cooling system experts; will check the cooling fan for damage and the fan belt for cracks. The radiator cools the antifreeze as it circulates throughout the system. A leak in a radiator hose can result in dangerous overheating condition and lead to major engine failure. Hyack Excel Tire's auto techs pressure test the cooling system searching for leaks in the radiator or hoses. We can find the small leaks before they turn into big problems. Neglecting basic cooling system and radiator maintenance can potentially lead to a radiator replacement or major engine or radiator repairs down the road. We recommend you have your Cooling System Maintenance Check done once each year. What's with all the heat? Although gasoline engines technology has made many significant improvements over the years, they are still not very efficient at turning chemical energy (gasoline) into mechanical power. Most of the energy (up to 70%) released by burning gasoline is in the form of heat; with 30% converted to movement. The cooling system's primary job is to keep the engine from overheating by dissipating this excess heat into the air. In addition, the cooling system has several other jobs. A modern car engine is designed to operate at relatively high temperatures. When the engine is cold, the oil does not lubricate the engine components well, resulting in more wear and tear. A cold engine is less efficient at burning gasoline and emits more pollution. Another job of a well performing cooling system is to allow the engine to heat up quickly, and then maintain a steady temperature so it can perform at its optimal level. If you need tires, Now is the best time to buy them. Tire Manufacturers rebates for Spring 2019 are now available! Ensure your vehicle is ready for all the driving conditions you will encounter this summer. Call Hyack Excel Tire today. Being new to the area, I was looking for a shop close to my work. I my first visit today where I got a wheel bearing replaced and 4 new tires for my RAV4. The staff was nice, they seem honest and didn't try to push more work that I didn't need and got everything done in a timely manner. I'm happy with the work and will be back again.